I recently had the honor of leading a workshop for singer-songwriters at a music festival. The title of my workshop was “5 Tips for Getting Publicity,” and an important facet of what I taught was how to work most effectively with the media. * What is your music “all about”? Anyone who can answer those three questions—clearly, concisely, intelligently, and without arrogance—will have a decided advantage in cultivating positive relations with the media . . . and, by extension, with current and prospective fans. I am now available to teach the workshops “5 Tips for Getting Publicity” and “How to Get Gigs in Nashville . . . Even If You Have No Following” to individuals and organizations. For more information, please email me at DaveCarew1964@gmail.com. How does an artist hope to affect the world? What impact does he or she hope to have? In the case of Chakra Bleu (pronounced Shock-ruh Blue), the passionately desired impact is to bring more beauty, peace, hope, and inspiration to the world. That alone makes “Bleu” an artist worthy of our respect and attention. Back in the day, Chakra Bleu was a full-fledged, Fleetwood Mac-esque rock band, playing to large and enthusiastic audiences at clubs like Douglas Corner and the French Quarter (ah . . . the good ole French Quarter). The band now has been stripped-down to its roots and soul, with just lead singer / songwriter “Bleu” carrying on as Chakra Bleu. That transition has resulted in music more Americana and country in feel—in fact, several songs from Souvenir have already charted on Country and Indie Country charts—yet “Bleu”’s musical journey still retains its impassioned embrace of love, spirit, and the mystic. Among the stand-out tracks on this record are “Sabotage,” “She Walks Alone,” and “Addicted to You,” all of which have recently charted. Produced by Chakra Bleu and David Henry (Cowboy Junkies, Indigo Girls), Souvenir is the latest contribution from an artist whose talent and spirit have brought new hope and beauty to our world for more than a decade. I find it amusing that everyone suddenly feels the urge to use the words “eclectic” or “iconic” every other sentence. What is even more amusing is, virtually every time you hear someone use one of these words, he or she is using it incorrectly. Back in the day, left-wingers made statements like, “America is run by money. There’s one set of rules for the wealthy, another for everyone else.” Now, sadly, almost everyone seems to believe that. One extremely negative consequence of the Great Recession is that everyone is whoring after money worse than ever. You cannot communicate with ANY (for example) customer service representative without their trying to “up-sell” you on everything under the sun. Ironically—for me, and I would guess for most people—this actually makes you LESS likely to want to deal with that company. I recently read the novel Silver Linings Playbook after seeing the (fantastic) film. In the book, the protagonist repeatedly declares his new creed: “Practice being kind, rather than right.” This country would be in a much better place if more people lived in that spirit. 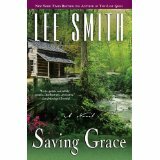 Published in 1995, Saving Grace by Lee Smith is the story of “Gracie” Shepherd’s tortuous pilgrimage, an embattled journey between the works of the flesh and the fruit of the spirit. Gracie’s father, the Rev. Virgil Shepherd, is a charismatic preacher at the Jesus Name Church of God who takes up serpents—timber rattlesnakes, copperheads, and moccasins—as a “sign” of God’s miraculous presence. A plaster saint, scalawag, and compulsive womanizer, Virgil alternates between the passionate preaching of God’s Word and periodic backslidings with hussies. Confused by her father’s hypocrisies and by the tragic death of her mother, Gracie is seduced by her half-brother, Lamar; marries a dour “saint,” Travis Word—a man 25 years her senior, by whom she has two children—and, deserting her husband, has a torrid affair with a married man, handyman Randy Newhouse. A feisty gal who has too much animal nature, Gracie suffers from a lack of constraint, and is unable to control her emotions. Although indulging in trashy behavior, she is a person searching for hard ground in a world of shifting sands. One pulls for Gracie—that this lost soul might be saved, that she might find light in a world of darkness. In a note following the end of the novel, Lee Smith offers a personal and most revealing comment: “In a way my writing is a lifelong search for belief.” Although she claims that Saving Grace is entirely a work of the imagination, Ms. Smith forces us to wonder if she has experienced in her own pilgrimage a similar soul-wrenching conflict of unbelief and faith. Saving Grace is a powerful tale of Gracie’s struggle to free herself from her father’s rigid fundamentalism and find emotional stability in a world full of devilish temptations. The conclusion of the novel is ambiguous: Will Gracie yield to her mother’s suicidal despair or finally find peace of soul? You are currently browsing the Underground Nashville blog archives for May, 2013.